RAF Type H Oxygen Mask (1945-1989). Over the last weeks, I've been working on upgrading the flight navigator's station. As with the engineer's station, new finds (original manuals) mean I have a much better idea about the equipment fitted in the racks. While doing so, I decided the oxygen masks I modelled (years ago) were dreadful. The parts manual listed two types of mask, an Airmed SP2 for civilian aircraft and an RAF Type H for Transport Command. It's obvious that the Airmed SP2 was more suitable for civilian crews, because it attached via the headset, where the RAF Type H attached to a (leather) flying helmet. 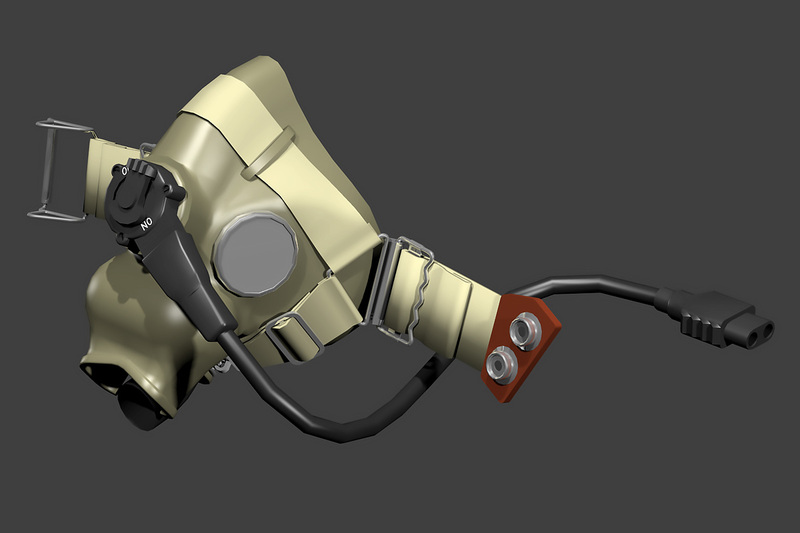 However, I could not find an SP2, but RAF Type H masks are abundant. There are also many photographs of DH test pilots and other pilots wearing RAF flying helmets, so there's room for artistic license — at least until I find a complete SP2 to model.